Sic Bo is a table game. The table it is played on is similar to a Roulette table where you have many places on the table to place your bets. It is played with three dices which are used to determine the outcome of the game. 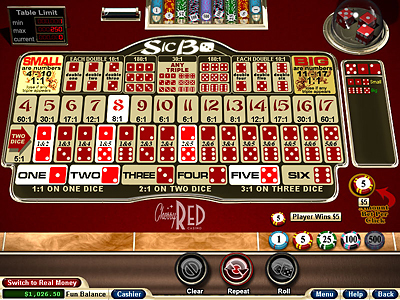 The bottom row of the Sic Bo table is divided in six betting areas. Those are called single number bets. In this row you basically bet which numbers will be showing up after the dices are rolled. If one of the three dices shows the number you bet on, you win and get paid a 1:1 odd. If two numbers show up you get 2:1 odds and if three show the odds are 3:1. For instance: You placed your bet on the number three on the table and two of the dices show a three you get double your stake back. In this kind of bet you bet on whether the combined result of the roll will be either between Four and Ten (small wager) or between Eleven and Seventeen (big wager). The odds on this bet are always 1:1. If the result of the dice roll is a triplet (i.e. : 3 - Fours) both of the wagers loose.